Global PE markets have been on a steady decreasing trend since two months now, according to ChemOrbis. The bearish trend has been extended into next month now that initial September PE prices started to be announced lower, as expected, due to a number of factors such as sharply falling crude oil costs and globally slower economic data. NYMEX crude oil futures settled below $40/barrel for the first time since more than 6 years on Monday. 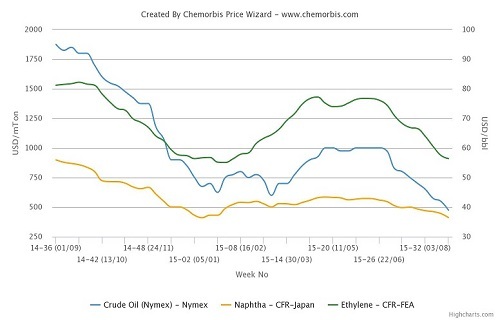 According to ChemOrbis Price Index, average weekly crude oil prices plummeted 35% during the period. The recent lows exacerbated the losses in spot ethylene costs, which touched $900/ton CFR Northeast Asia on Tuesday. Spot naphtha prices were down by around $50/ton week over week on CFR Japan basis, hitting the $400/ton threshold on Monday. A converter in Malaysia reported receiving fresh HDPE and LLDPE film prices from a different Middle Eastern supplier. “Although the producer cut their prices to below $1200/ton CFR, we are not satisfied with the drop considering current spot naphtha and ethylene prices.” Malaysian buyers are concerned about the depreciation of the Malaysian ringgit and keep their purchases reduced. A trader in Vietnam expects to hear new Middle Eastern PE prices from his supplier at or below the $1200/ton threshold, justifying his opinion with slow trading activity. “Buyers are only purchasing small volumes. Prices may continue to move down until year end before rebounding afterwards,” he argued. Overall, Asian players are not willing to import material at current price levels as they are not confident about the future outlook. “The bearish upstream chain, lower yuan and poor demand keep players sidelined to monitor developments,” players report. Looking at other fresh offers, a Middle Eastern PE producer initially approached Turkey with new prices on Tuesday. The producer’s most recent offers indicate decreases of $30-50/ton for LLDPE, $20-40/ton for LDPE and $30/ton for HDPE film from its last August levels as per ChemOrbis pricing service. “We are facing resistance from buyers towards our PE prices. Prices will probably reach the $1200/ton level soon,” a producer source admitted .